This year will mark the fourth annual award ceremony and gala of the Global Fine Art Awards. Founded to celebrate the best in curated exhibitions from all over the world, the entries are judged on exhibition design, historical context, educational value and public appeal. The fifteen awards cover a range of categories, from ‘Ancient Art’ to ‘Photography’, and this year the GFAA’s reaffirms its commitment to the international with the new ‘Global Planet’ and ‘Global Humanity’ awards. The juried awards are accompanied by the prestigious YOUniversal and YOU-2 awards, which are chosen by public vote. While the YOUniversal winner has already been selected based on a web-poll, the runners up will compete in a twitter campaign for the second place YOU-2 award. This continues throughout February, so you still have a chance to be a part of the debate by tweeting at the GFAA, #gfaa2017. A full list of the nominees and more information can be found on their website, and the winners will be announced on March the 8th 2018. With an overwhelming list of 85 nominees and 33 finalists, the awards include international exhibitions from Toronto and Humlebaek, to Singapore and Shanghai. With so much to have seen, we can only hope to give a small flavour of the wide-range of nominees. Transatlantic travellers were in luck last year, as London and New York each hosted seven of the finalists. Looking down the list of exhibitions, there is no shortage of famous European artists of the 20th century, including giants of the art world, Picasso, Matisse, Monet and Rodin. Designers and art movements from America make a similarly strong showing, including both the Royal Academy’s survey of ‘Abstract Expressionism’ and ‘Frank Lloyd Wright at 150: Unpacking the Archive’ at the Museum of Modern Art. This plethora of blockbuster shows undoubtedly attract enormous visitor numbers, and certainly fulfil the awards’ criteria of having a strong public appeal. But, perhaps the element that makes these awards special is the inclusion of well curated shows that move away from the conventional notion of the Artist. The V&A’s ‘Opus Angelicanum: Masterpieces of English Medieval Embroidery’, saw a collection of English medieval embroidery brought to London. Despite the sheer number of hours involved in making each textile, the names of the creators are generally unrecorded; instead, patrons and locations take priority in the documentation. The show explored the conundrum of whether the nameless medieval craftsman should be considered artists, with their own agency in the design process. Lacking the usual biographical details of the works’ creators, the exhibition brought to life the medieval period by focusing on the political and social contexts they inhabited. My own preconceptions of the time were challenged, the brightly coloured textiles shattering my previous misconceptions of a dreary, mud coloured medieval setting. 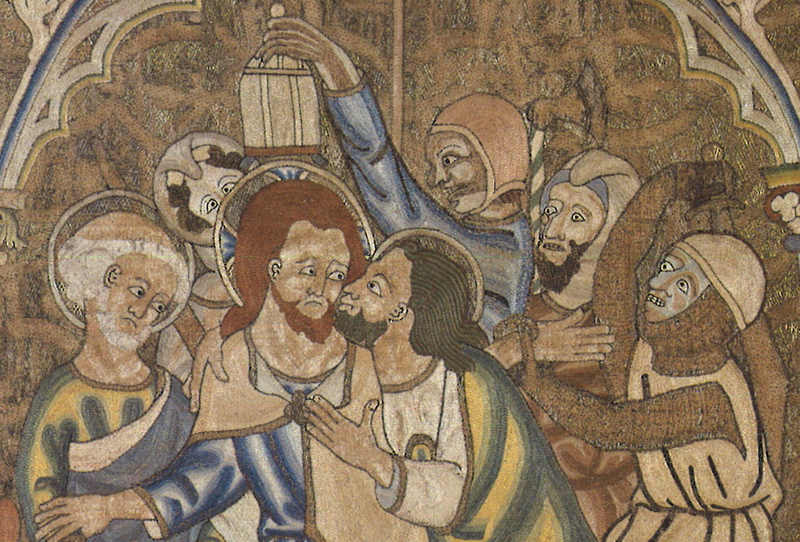 A 14th century panel depicting the Life of Christ was particularly interesting. Thought to have originally hung in front of an altar, local parishioners from all social strata would have viewed it during services. Even at first glance, the comical expressions are immediately striking, exaggerated as they are to the point of caricature. This cartoonish overemphasis is a product of the textile’s original context. In the 1300s, viewers would have seen it from behind a partial screen some distance away. But there is something infinitely appealing in the fact that modern viewers – regardless of our grasp of medieval theology – can access and enjoy the piece. Therefore, despite the lack of a known artist and uncertain origins, the humour of the textile still manages to engage visitors to the exhibition, while simultaneously reminding us that medieval life was not nearly as drab as Hollywood would have us believe. By including celebrations of unidentified craftsmen alongside solo shows of fine artists, the GFAA awards emphasise the underlying thread of these exhibitions. Each aims, in its own unique way, to communicate to the visitor how culture is moulded and able to mould society. The chosen body of exhibitions show a real attempt to incorporate innovation and reward the introduction of new narratives to the art world. Like the V&A exhibition, this can involve moving away from the life of an individual artist, or alternatively can take the form of diversifying who is represented in the artistic canon. In Venice, the Museo Correr displayed the Iranian artist and filmmaker, Shirin Neshat’s new show ‘The Home of My Eyes’. Comprised of 55 photographs, the series documents the diversity within Azerbaijan, a country which until the 19th century was part of Iran. Neshat is particularly interested in the similarities in culture across the border and uses the series to study the multiple and complex identities of her subjects. Spanning multiple ages and ethnicities, the work attempts to show the shared humanity of her sitters by dressing them in similar clothing and repeating the same Christian religious gestures. Yet, superimposed on top of each photograph is a unique text; each is composed by the artist in response to a conversation between herself and the sitter about the concept of identity and home. Shortlisted for the Global Humanity award, this exhibition best summarises the complex nature of cultures in a global society, and an international artistic exchange that the GFAA aims to celebrate. In the run up to the announcement of the GFAA winners, it is well worth browsing through the finalists online. The GFAA website proves a great starting point to explore exciting shows you may have missed. Until March, we can only speculate as to which exhibitions will be chosen, but all of the finalists warrant your attention and serve to illustrate the current variety in curated exhibitions.